Earlier Today, we reported that the Syrian Electronic Army has hacked Saudi Arabian Ministry of Defense and other Government websites. 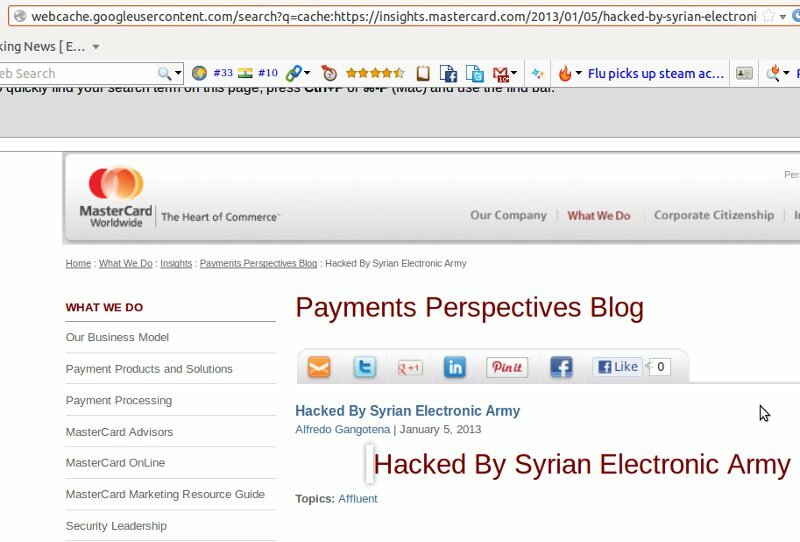 Now , we have come to know that the MasterCard blog got hacked by the same hacker group. The hack was initially identified by Eduard Kovacs from Softpedia. The hackers appear to have breached the Payments Perspective Blog from MasterCard’s Insights site(insights.mastercard.com). They have added a post with title “Hacked By Syrian Electronic Army.” The post has been removed ,at the time of writing. But you can see the post made by the hackers in Google cache: "http://webcache.googleusercontent.com/search?q=cache:https://insights.mastercard.com/2013/01/05/hacked-by-syrian-electronic-army-3/"
The google Evidence shows that the cache recorded on Jan 6 and post has been added on 5th Jan. It appears that the Site uses the outdated Worpress version. If you check the source code of the blog, you can identify the blog uses the old version 3.3.2 of Wordpress.